There are so many artisans in Florence, it’s almost impossible to choose between them all without our handy list of decorative and craft art institutions, including: jewelry, goldsmithry, engraving, ceramics, leather work, glass work, batik, book art, furniture design, pottery, mosaic, framing, etching, lithography, weaving, printmaking, illustration, and serigraphy. Conceived and founded in Florence in 1985 by Giò Carbone, Le Arti Orafe is a prestigious private Italian school for contemporary jewelery and engraving, born along original lines that combine technical training, artistic research and contemporary design. The school offers a wide range of courses, from which the students can choose that most suited to their training requirements. From the first day of the course the students work with silver and stones, of which they have a huge store available. All materials are included in the fees, and students keep all the jewelery they make, except for one piece which remains at the School. Courses include leather working, jewelry, ceramics, glass work, in addition to design, restoration, cooking, painting, drawing, and Italian language. The Metallo Nobile school was established in 1998 and is located in the old part of Florence a stone’s throw from the Ponte Vecchio, in the arts and crafts quarter. The school premises are in a historic building with classrooms for drawing and designing both by hand and by computer, and a large, fully-equipped workshop with individual professional workbenches, and the instruments and tools needed for the various specialisations like engraving, casting, setting, chiseling, embossing, wax modeling, fretwork, as well as machinery for complete-cycle casting. 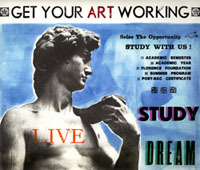 In affiliation with The Art Institute of Florence, we offer a wide range of Studio Art courses at all levels including Jewelry Design, Printmaking, Ceramics, in addition to painting, drawing, sculpture, photography, theater, music, dance, fine art restoration, interior, graphic and fashion design, cooking, film and multimedia. Course in batik, ceramics, book art, furniture design, etching, lithography, weaving, printmaking, and serigraphy, as well as many other in the fine, conservation, performance, visual, liberal and decorative arts; design; and Italian language. Workshop “La Bottega dell’Acquaforte” of Master Massimo Baicchi was born in Florence in the ’80’s as an Atelier. Here, study, research, mystical concentration and emotional expression concur to form the inspiration that produces a “Work of art“. In the atelier, Baicchi produces works of ceramics, printings, etchings, engraving, in addition to contemporary art of painting and sculpture. We offer courses in printmaking, etching, lithography, letterpress, hand press, book works, and typography in addition to painting, drawing, Italian studies and language, video, photography, and digital media. 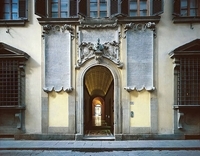 The International School of Specialisation in Printmaking ‘Il Bisonte’ offers courses in the traditional techniques of printmaking, following the old tradition of artistic skills and craftsmanship of the printing workshop established in 1959. The School puts at the disposal of its students tools, stella presses – at which over two hundred contemporary artists have worked – a three-thousand-volume library, photographic archives with thousands of slides and colour photographs, and the archives of works carried out in the stamperia and school. Studio Giambo offers a wide variety of art courses in historic downtown Florence, for beginners, intermediate and advanced. First class facilities, and instruction by qualified, certified professionals. Classes are in small groups, which ensures in-depth study of subject chosen in an ideal instructor-student team-work atmosphere. Studio Giambo has over 35 years of research and teaching in the field of traditional Florentine arts. Courses offered include techniques of modern mosaic, glass, ceramics, majolica and either Florentine or modern pottery in addition to fashion, Italian language, drawing, painting and sculpture. Montelupo Fiorentino Pottery School – member of “Empolese-Valdelsa Development Agency” – is a vocational training centre characterized by high-level teaching methods and a practical approach. Montelupo Fiorentino Pottery School boasts 25 years of experience in the pottery world and offers high-level training, thanks to qualified school management and teaching staff: cooperation with University Depts and manufacturing units ensure the transmission of all theoretical and practical knowledge necessary for keeping an otherwise dying art alive. The School differs from a “classical” art institute or Academy, aiming for more technical and practical results. Most students don’t in fact have specific experience. The teaching method, consisting of a profitable pairing of theory and practice, has been gradually fine-tuned over the years, such as the bibliographic material on the subject which is internally created and printed. Courses mainly aim to make students completely able to manage this wonderful art, autonomously, in all its forms. The school is about 2000 square meters, divided in a very equipped laboratory, drawing room, didactical multimedia room and showroom. In the laboratory there’s space for 15 potter’s wheels and 20 painters. La Scuola Laboratorio di ceramica di Villa Guicciardini a Montughi ha radici ben lontane, quando, a sostegno di alcuni minori svantaggiati accolti nell’Opera Madonnina del Grappa ma emarginati dalla scuola pubblica, fu creata una casa-scuola sperimentale in modo da far conseguire il diploma di terza media, privilegiando l’educazione artistica. 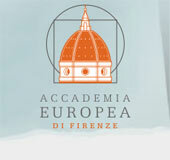 Grazie all’apporto artistico di maestri di elevata professionalità, il laboratorio ha raggiunto un altissimo livello riuscendo ogni anno ad esporre i propri capolavori in prestigiose sale di Firenze e di altre città d’Italia ed a partecipare a numerose mostre mercato in occasione di fiere, feste patronali o mostre dell’artigianato. We offer courses in ceramics and refurbishing, as well as Italian language, arts, music, food and culture courses. In the neighbourhoods of Santo Spirito and San Frediano art and artisan workshops still operate, producing objects and artifacts which are the fruit of refined workmanship and techniques that have been handed down for centuries. In the interest of promoting this inheritance, in collaboration with Florentine artists and artisans, we re offering a vast range of courses which allow participants to refine or learn artistic techniques by working in direct contact with these professionals in their workshops. Our programme has individual and group courses varying from one to six months. Days and hours involved will be arranged according to the reciprocal needs of both craftsmen and participants. We offer jewelry and costume jewelry; pottery; Florentine mosaic and marbled paper; leather work (bags, belts and shoes); inlay; glass, textile, and wood decoration; antique paper and book restoration; window dressing; glass work; gliding; picture framing; bookbinding; in addition to painting, drawing, sculpture, restoration, cooking, Italian language, music, and history of art classes.